And over the next 110 days they will introduce, consider, debate, and pass policies that impact us all in every aspect of our lives: policies on factory farms and clean water, healthcare, education, working conditions, our state budget, and more. We’ll be your eyes and ears at the Capitol tracking bills – good and bad – to let you know when your calls, emails, or weekend visits with your legislator can have a big impact. To help you get ready, here is our take on what we can expect going into this year’s General Assembly. Policy making should be the people’s business, not done behind closed doors by industry insiders. We believe those most impacted by a problem should be in the driver’s seat to craft the solution. 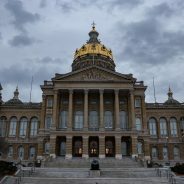 We believe in fighting for what our communities need, not what some view as winnable in the moment.In order to win our vision for Iowa, we need to change who is at the statehouse. We need more folks like you, who come out of our work together, running for office. Our organizing work, paired with our statehouse work, paired with more work in elections will help us set the political stage on which the 2020 caucuses and elections are played out. As always, let us know what you are hearing in your community – from neighbors and from your elected officials.